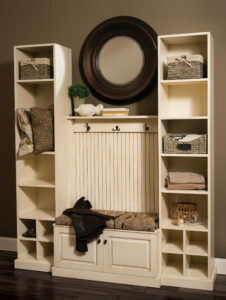 Make a practical and beautiful addition to your entryway or hallway by choosing a Bench with Hall Tree from Weaver Furniture Sales. 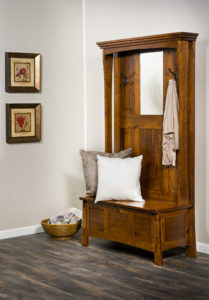 Each hall tree bench comes with hooks to hang coats, cupboard space to store shoes and a seat to get shoes on and off. Plus a mirror to check that every hair is in place. 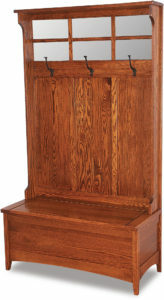 Also, the top Amish cabinetmakers in the Midwest custom-build each unit. So the entry hall benches are incredibly sturdy. In fact, with proper care, the unit you choose should stay in service for decades to come. So check out the large online collection. Or, visit our ‘brick and mortar’ store in Shipshewana, Indiana. And discover which hall storage bench is the best choice for your home. 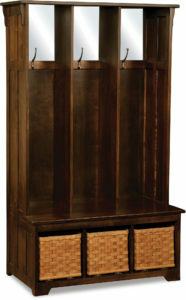 Given the practical features and great looks of the Bench with Hall Tree collection, the only question is which unit is right for your entryway or hallway. Check out the collection. And you’ll notice that we offer a wide variety of styles and designs. So you’re certain to find one that fits your needs best. Also, you can order a unit as shown. Or, we can customize it to your specs. 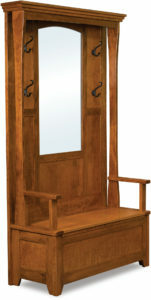 And your customizing options include wood specie – such as oak, maple, cherry and hickory. Also, you get to choose the hardware and the stain/paint/dye.